An online bachelor's in computer science prepares students for high-paying careers in software development, managing and maintaining networks and databases, computer systems analysis, and more. Students seeking an online computer programming degree take courses in programming, software development, robotics, and others, combining technical skills with a theoretical understanding of computer science. It is particularly useful to study computer science online, as this field requires students to be comfortable with rapidly changing computer technologies. Affordability is a major concern for students pursuing an online degree in computer science, however, it may be misguided to simply look for the cheapest online computer science programs in terms of tuition. Because online programs allow students to work full-time, foregoing the ancillary costs of campus programs, evaluating the true value of a program is prudent. In other words, it is important to note the difference between simply finding a cheap online computer science program and an affordable online computer science program. The latter should offer a high-quality education with comprehensive financial aid. These colleges should also have a proven track record of helping online students graduate, without forcing them into long-term debt. 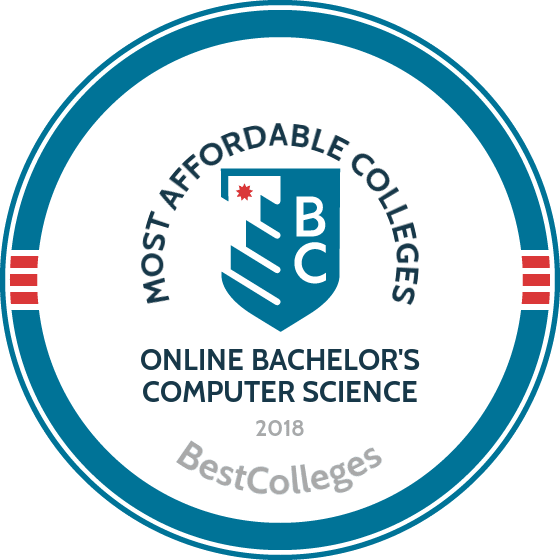 To assist students in their search, we've created a ranking of the top 10 most affordable online bachelor's in computer science programs. Programs are ranked using our new College Affordability Score, which combines many financial and success factors to determine the comprehensive affordability of a degree, rather than those with the cheapest tuition. Factors taken into consideration by the College Affordability Score include return on investment (ROI), the amount of financial aid given to students at the school, the number of students taking out loans, and the number of students able to repay their loans (low default rates). The University of Florida Online offers a BS in computer science through its College of Liberal Arts and Sciences. The program prepares students for careers in healthcare, security, research, and business, and the curriculum is customizable to one’s interests and skills. This affordable online computer science degree requires 120 credits to complete. Coursework includes communications, mathematics, programming, software engineering, and electives related to the major. Full-time students can finish their degree in as few as eight semesters. The university accepts applications for fall, spring, and summer start dates, and offers a generous transfer policy. Students with 12 to 59 previous college credits can apply for the college’s lower division, provided they hold at least a 2.5 GPA and coursework in analytic geometry and calculus. Those with 60 or more credits can apply to the school’s upper division, and must have a minimum 2.5 GPA and coursework in advanced geometry, calculus, and physics. The BS in computer science at the University of Illinois deepens students’ understanding of computer science fundamentals while they strengthen their analytical and problem-solving abilities. Given the demand for experts in this field, graduates from this online bachelor’s in computer science enter careers in business, government, education, and many other industries. One of the best online schools for computer science, the University of Illinois requires coursework in programming, web development, and operating systems. The university also works with students to best leverage prior learning for their intended degree. To gain admission, students must have least 30 transferable credits from previous college classes and a minimum 2.0 GPA. Students must also complete internships to practically apply their coursework. Placements can include state agencies, computer firms, and insurance companies. The university accepts students twice per year in the fall and spring semesters. One of the best online computer science degree programs in the country, the BS in computer science with computer science concentration at the University of Houston develops future programmers, analysts, engineers, and secondary school teachers. The rigorous curriculum may also be good preparation for graduate work in the field. This asynchronous degree program emphasizes design, development, and management of computer-based solutions. In addition to 42 core curriculum credits, students enroll in studies such as computer literacy, programming fundamentals, and database systems. In total, graduates complete 120 credits to earn their degree. The additional computer science concentration carefully studies areas like artificial intelligence, software project management, computer graphics, and more. Transfer students must have at least 12 credits with a minimum 2.0 grade point average to be eligible for admission. As the first university in Maryland to offer a computer science program, Towson University has three online computer science degree programs from which to choose: computer science, information systems, and information technology. The BS in computer science develops computer-based solutions to contemporary problems. Students may specialize in computer security, where they learn the most innovative security theory and applications. They may also specialize in software engineering, which is the design, implementation, and support of software programs. Students in the BS in information systems program solve computer challenges that prevent companies, organizations, and the government from achieving their goals. Four tracks are available to tailor one’s studies: systems, business, interface design, or e-government. In the BS in information technology students select, create, apply, integrate, and administer computer and communication technologies for organizational and social contexts. This major prepares graduates for either a career or graduate studies. The George Washington University’s online bachelor’s in computer science uniquely blends mathematics, science, and communication. The university’s BS in computer science program requires core classes in humanities/social science, and major coursework in software development, algorithms and data structures, and computer architecture. All students complete at least 30 credits in residence at the university, and may be completed through any of the available study abroad programs. In addition, each student selects a technical and non-technical track. Technical tracks include studies in artificial intelligence, computational mathematics, computer graphics, and computer security; non-technical tracks include technology and law, pre-medical, business, and project management. Students must also complete an eight-credit senior design project before graduation, which fosters the development of an “industrial strength” project. Freshman applicants submit a high school transcript and letters of recommendation for admission, while transfer applicants add their previous college transcripts. Athens State University’s BS in computer science strengthens students’ programming, problem solving, and analytical abilities through a rigorous curriculum of leveraging hardware and software resources. As preparation for a career in business and industry, or a seamless transition to graduate studies, this affordable online computer science degree establishes a strong foundation in the discipline. Students complete both general education and major-specific classes, such as database systems, algorithm analysis, and assembly language. A concentration in information security is also available, which provides a framework for safeguarding the integrity and privacy of information and the devices in which it’s stored. Students in this concentration take classes in digital forensics, cryptography, and information assurance. Since Athens State University is an upper-division university, all applicants must have previously completed college-level credit. The university accepts any student, provided they submit an official college transcript and complete the online application. The BS in information technology – completion program at George Mason University (GMU) attracts prospective learners who hold an earned associate degree, or who have completed significant coursework at a regionally accredited institution. Graduates of this computer science degree online program possess the problem solving, writing, and communication skills to support public, private, and nonprofit entities. The university’s career services center provides additional help to students by providing career information and counseling. Completing this 120 credit program requires coursework in programming, database fundamentals, and systems analysis and design. Students must also complete a two-semester capstone sequence -- a hybrid online class that engages them in a senior design project. To round out their degree, each person selects a concentration area in health information technology, networking and telecommunications, or web development and multimedia, among others. A minimum of 30 credits must be earned at GMU, but those with previous college credits in the Virginia Community College System should refer to university guidelines to determine which credits will transfer. The online BS in computer science at the University of Maryland (UM) is among the most affordable online computer science degree programs in the U.S. Students engage with world-renowned faculty who are thought leaders in their field, and who conduct cutting-edge research in areas like artificial intelligence, computational biology, and virtual reality. Classwork includes calculus, programming languages, and secure systems and architecture. Students in this degree can also prepare for the Microsoft Certified Solutions Expert and Oracle Certified Java programmer exams. Experts from industry and academia continuously refine the program’s curriculum, which ensures students are given the freshest perspectives and industry best practices in the classroom. UM offers both a university computing club and Upsilon Pi Epsilon, the international honor society for computer science. Prospective students can transfer up to 90 credits from prior college coursework. The computer science online degree at Central Washington University (CWU) prepares graduates for careers in business and industry, where theoretical studies, experimental techniques, and engineering methodology become applied practices. CWU’s BS in computer science delivers a robust curriculum via traditional classroom coursework, but also through research, laboratory activities, and internships. In addition to courses in computer architecture, language design, and operating systems, CWU seniors complete a capstone project that weaves together their creativity with their understanding and application of experimental and design approaches. In total, students must earn 106 credits to fulfill degree requirements. Admission requires a high school transcript with at least a 2.0 GPA and a satisfactory Compass, SAT, or ACT exam score. Those who wish to transfer college credits must also submit their college transcripts and carry a minimum 2.5 cumulative grade point average. Park University’s BS in information and computer science provides the foundational knowledge students need to excel in their careers. Graduates of this computer science degree online are ready for positions like web programmer, systems analyst, and information technology project manager. Advanced graduate studies may also be an option. Information and computer science students select from among four specialties at Park University: computer science, software engineering, data management, and networking. Courses in web programming, programming, and information systems build competencies in problem solving, critical thinking, communication, and ethics. Admission requires a high school diploma or equivalent, and a cumulative 2.0 GPA in all previous college-level studies. Expert faculty lead small classes to foster student engagement, and courses are scheduled in accelerated, eight-week terms that begin five times per year in January, March, June, August, and October. The BS in computer science at Regis University prepares graduates to design and execute computational solutions to some of the world’s most pressing political, social, medical, and economic issues. The university recognizes the value computer science adds to the world, and its rigorous programs develop professionals who can exceed the high expectations of the field. One of the best online schools for computer science in the U.S., Regis University couples theory and practice through required classes like data structures, computer architecture, software engineering, algorithms and complexity, and artificial intelligence. Students earn 120 credits to graduate, and admission requires a high school diploma, transferable credit from an accredited college credit or university, and relevant work experience. Students with military credit and professional licenses/certificates may be given university credit for their experience. The University of North Texas offers an affordable online computer science degree to that establishes a foundation for careers in technology and future graduate-level studies. Delivered through the university’s College of Engineering, the BS in computer science emphasizes the design, development, and implementation of software to solve some of the world’s most complex problems ethically and responsibly. The 121 credit to program requires 42 credits of advanced coursework like data structures and algorithms, software development, computer architecture, or engineering ethics. In addition, all students complete a senior thesis and capstone project that solves real-world design and developmental challenges. A 2.75 GPA in advanced computer science classes is required to graduate. Oregon State University (OSU) offers a fully online BS in computer science through its School of Electrical Engineering and Computer Science. This computer science program is designed specifically for students who already possess a bachelor’s degree in any field, and no previous coursework in computer science is required. Coursework in this online computer science degree includes fundamentals in programming, software engineering, mobile and web development, and systems and networking. This 60 credit program can be completed in one-, two-, three-, or four-year track options. And since students already hold a bachelor’s degree, they only need to complete computer science courses. OSU offers program start dates in the summer, fall, winter, and spring. In addition to an earned bachelor’s degree, admission requires a 2.5 cumulative GPA from previous coursework, and a personal statement describing past academic performance, current occupation, and the reason for applying to this program. The Department of Computer Science at the University of West Florida (UWF) offers an affordable online computer science degree that provides students a theoretical foundation in the discipline. This 120 credit program also introduces concepts in algorithms, software engineering, and programming. Offered as a specialization within the university’s BS in computing and information sciences, the computer science degree at UWF emphasizes problem solving and analytical thinking within the discipline. Major-specific courses like data structures, computation theory, linear algebra, mathematical logic, and mathematical statistics, and systems and networks are required alongside a general studies curriculum. Students also complete two capstone projects that design a software system to solve a real-world problem. To qualify for graduation, degree-seekers must earn a minimum grade of C- in all major courses and a cumulative grade point average of at least 2.5. The BS in computer science at Fort Hays State University is offered through the school’s newly established computer science department in the College of Science, Technology, and Mathematics. This online bachelor’s in computer science blends studies in software, networks, digital design, information security, and digital storage and retrieval to prepare students for careers in complex information and computing systems. This may include positions within the federal government, universities, and Fortune 500 companies. In addition to general education courses, students complete 38 credit hours in their major with courses like studies in systems architecture, Java programming, and networks and data communications. An additional one-credit internship is also required. Six concentrations are available to students: business, mathematics, geographical applications, physics, technology, or networking. Applicants are required to submit transcripts from all previous schools, and those over the age of 21 do not need to submit an SAT or ACT exam score. An affordable online computer science degree, the BS in computer science at Southeastern Oklahoma State University provides a robust foundation in the discipline. Major-specific courses are required in data structures, computer architecture, distributed networks, and web page design, while students also develop their programming languages in seminars on Fortran, Visual Basic, and Java. An internship is also required to graduate, which includes a supervised-site experience for which students must report through weekly and term updates. The university classifies students over the age of 21 -- and who are pursuing a degree for the first time -- as adult freshmen. Admission requires a high school transcript, an ACT score, and possibly a college placement test or remedial classes in the event of ACT scores below the school’s minimum. Those with at least seven hours of college credit can apply as transfer students. Transfer admission requires transcripts from all colleges and universities attended, proof of completed college-level English, math, history, and lab science courses, or an ACT score that meets the university’s minimum. The absence of satisfactory coursework or ACT scores will force students to participate in placement tests or remedial courses. City University’s BS in applied computing equips students with fundamental knowledge of computing and networking technologies. The curriculum integrates hands-on learning with classroom studies so learners can put theory into action. Moreover, expert faculty bring their extensive experience into each course. Based on certificate programs for Cisco Certified Network Associate, Microsoft Certified Systems Engineer, and Certified Information Systems Security Professional, this online bachelor’s in computer science prepares students for careers in networks, computing, and data systems. Core class requirements cover operating systems, information technology ethics, and project management. Students also complete a technology capstone that includes exams, oral presentations, and written assignments to demonstrate mastery of the degree program’s content. While the program is flexible, students can complete their degree in as little as two-and-a-half years. Offering one of the country’s leading online computer science programs, DePaul University provides students access to the most current technology and specialized laboratories through its School of Computing within its College of Computing and Digital Media. Learners deepen their knowledge of artificial intelligence, multimedia networking, and visual computing as they apply classroom lessons to solve real-world challenges. Courses include technical writing, discrete mathematics, and data structures. The university’s BS in computer science also allows degree-seekers to concentrate in gaming systems or software development. Both require completing 192 credit hours, earning at least a C- in all major courses, at least a D in all other liberal studies and elective courses, and maintaining a minimum 2.0 grade point average. Admission requires a high school transcript, an optional ACT exam score, and previous studies in English, social science, mathematics, science, and a foreign language. Students who have previously attended college can complete this degree in as few as three years by transferring 33 semester credits. Among the best online schools for computer science, Old Dominion University’s (ODU) BS in computer science program couples theory with hands-on laboratory experience, where students thoughtfully apply classroom lessons to real-world problems. Delivered through the school’s Department of Computer Science, this program encourages learners to develop projects to strengthen their competencies in every step of solution ideation. A mathematically and scientifically intensive program available fully online, this ODU degree requires 120 credits to graduate, 30 of which must be completed through ODU. Classes in data structures and algorithms, operating systems, and object-oriented programming and design offer comprehensive preparation for a variety of careers. Graduates find positions in software engineering, network administration, database development, and web and application programming, among others. Those who have completed a degree in the Virginia Community College System are guaranteed admission to permit a seamless transfer in their studies. The University of Massachusetts Lowell offers a highly respected BS in computer science that prepares graduates to adapt to the quickly evolving world of technology. Students in this online bachelor’s in computer science learn various programming languages and platforms. The program -- available fully online or as a hybrid program that meets online and in-person -- is designed to accommodate students’ busy schedules. This 120 credit degree requires 40 major credits, including agile software management, website development, programming languages, and multimedia studies. Learners can also select an area of focus: the arts and humanities focus offers classes in art appreciation and writing popular fiction, while the management focus adds accounting coursework. Other areas of focus include social sciences and math, science, and engineering. The BS in computer systems technology at Duquesne University is an affordable online computer science degree that couples computer systems and information technology to provide students with deep analytical and problem-solving abilities. The curriculum is designed for graduates to oversee today’s information systems by leveraging appropriate technologies to address complex organizational challenges. Delivered through the university’s Center for Adult Learners, this degree program includes coursework in programming, information technology leadership, technical writing, and project management. Admission requires a personal statement describing an applicant’s background and career goals, high school transcripts, and any previous college transcripts. In addition, applicants participate in an interview with an academic advisor. Informational webinars provide an opportunity to learn more about online programs and to have questions answered. Due to changes in higher education regulations, the university cannot accept applicants from Alabama, Arkansas, Iowa, Kentucky, Massachusetts, Minnesota, New Mexico, Oregon, Washington, and Wisconsin. One of the best online schools for computer science, the University of Wisconsin – Stout is known for its BS in information and communications technologies (ICT) program. Highly flexible and fully online to accommodate the schedules of working professionals, this program allows students to continue previous studies by transferring earned credits. This program is also part-time, further assisting learners with outside commitments. The ICT curriculum includes topics in media, networking, enterprise systems, and leadership development. The university places students in co-op internships that provide an opportunity for experiential learning through hands-on application of classroom lessons. Those enrolled in the program can also opt to minor in enterprise technology, computer networking systems and design, and web technology. The university requires applicants submit a high school transcript, an ACT or SAT score, and a completed application. The average profile of its 2016 freshman class is a student with a high school GPA of at least 3.0 and an ACT composite score from 21 to 24. Lewis University offers both an accelerated BA and BS in computer science fully online. Given the growing demand for professionals with computer science competencies, these degrees allows students to advance their career by building knowledge in programming and networking to help companies collect, analyze, and secure data. Students develop skills in writing software, designing networks, and overseeing cyber security tasks. The 128 credit BA in computer science degree requires 46 credits in the major, and at least 30 semester hours of transferred credit. The BS in computer science is also 128 credit hours, but requires 53 major credits. Students in the BS program can select an additional concentration in game and simulation programming, pervasive computing, computational theory, or data science. Graduates of both programs are prepared for careers as network engineers, simulation experts, or database developers. The BS in information technology at Granite State College (GSU) explores how organizations use information to optimize operations and prepares graduates with skills in programming, systems analysis, and software tools. Coursework includes critical inquiry and visual programming, and a variety of other programming and database management systems. This 120 credit online computer science degree requires 30 credits to be completed through GSU. Most classes are delivered online, with only a few courses facilitated on campus. Faculty possess robust expertise in the field that enables them to lead practical instruction that translates directly to the workforce. GSU also makes career counseling available to all students and alumni. Applicants may apply on a rolling basis and can begin during any term, once accepted. GSU requires a high school diploma for admission. Georgia Southwestern State University’s online computer science degree emphasizes analytical and problem-solving abilities to more carefully and effectively build information technology-based solutions. The university’s BS in information technology also develops competencies in teamwork to prepare graduates as leaders in the field. The 120 credit degree requires classes in programming, discrete math, and database design, development, and deployment. While the program is offered online, students can communicate with professors through email, chat room, and discussion forums. Non-traditional students (age 25 or older) must submit a transcript and earn the minimum exit score for three sections of the university’s Compass Exam. Those with an earned associate degree may transfer some credits to this bachelor’s program. Admissions are rolling with semesters beginning in August, January, and May.